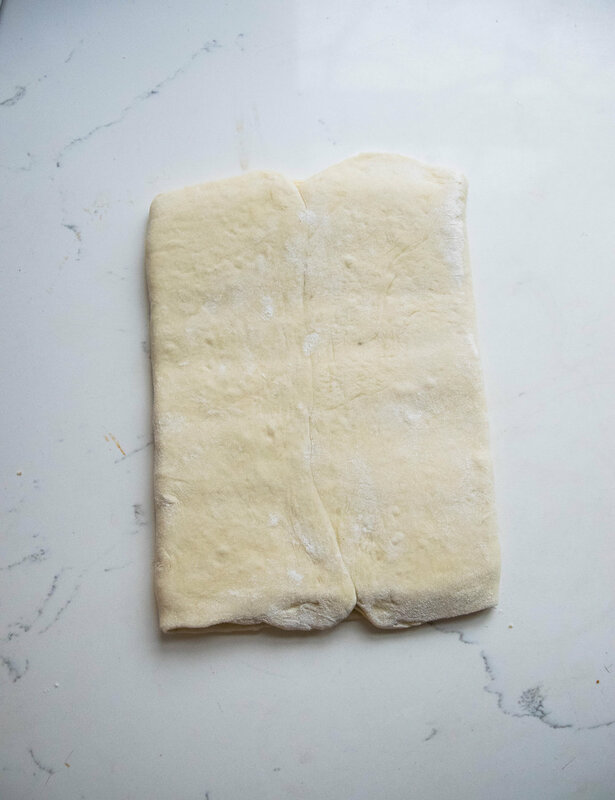 Dough lamination is the process of folding butter into dough (and sometimes the other way around, like for arlettes), creating alternating dough-butter-dough layers that you can see with your own eyes! When baked, water from the butter will turn into steam and puff up between the layers. This creates the delicate and flaky layers of croissants, kouign amann, and puff pastry. The following steps can be applied to many types of pastries. There will be small tweaks and adjustments that need to be made for different recipes, but this guide should help you navigate through the basic buttery slopes of détrempe, beurrage, paton, folding, and turning. And folding again. And again. La détrempe refers to the dough portion of your pastry. This is the first step in your pastry-making journey, and the dough will usually consist of simple ingredients like flour, water, salt, and yeast. An enriched dough might feature additional ingredients like butter, milk, and eggs. 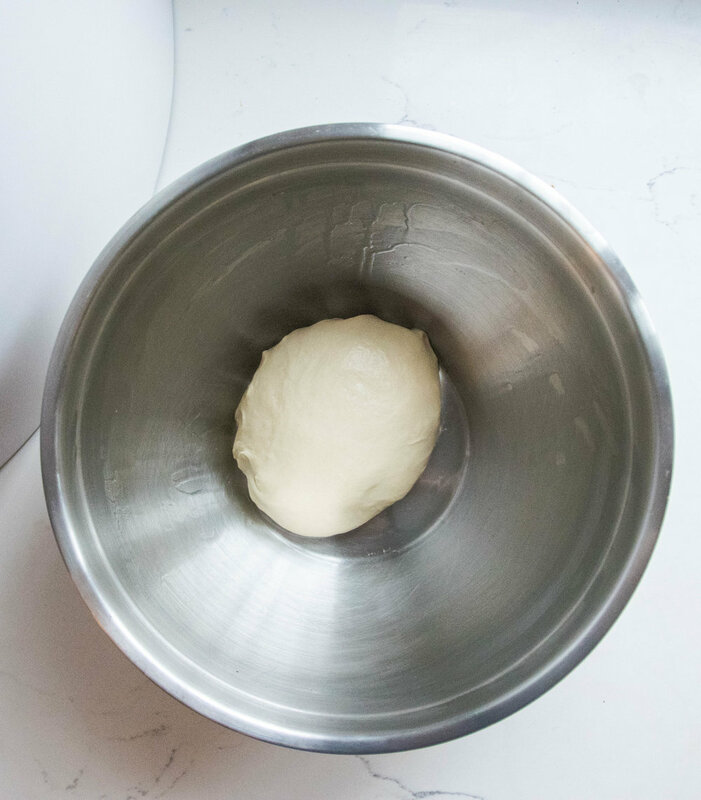 Whichever form it takes, the dough comes together within minutes and is usually left to proof at room temperature until doubled in size or overnight in the fridge. I use a stand mixer fitted with the dough hook attachment to mix together the ingredients of my détrempe, but you can easily do this by hand as well. The time that this dough is kneaded for depends on what you're making. You do not want a lot of gluten development in something like puff pastry because it has to be extremely flaky and crisp. In croissants, you'll be kneading the détrempe for a bit longer to build gluten sturcture in the dough that will eventually give structural support to your lovely croissants! After I have proved the détrempe at room temperature, I will flatten it out into a small rectangle and chill in the fridge for 10 minutes. The purpose of this is to cool down the dough to prevent it from warming up the butter in the next step. My first time making a beurrage was unlike anything I'd ever done in the kitchen before. You take large amounts of butter, roll it into a rectangle, and fold that into dough. Pardon? Beurrage, or the butter block, is what's encased into your détrempe. There are many methods to prepare the beurrage before you encase it into the dough. I like the softened butter approach. About 15 minutes before my dough is ready, I take room temperature butter, sandwich it between two sheets of parchment paper, roll it out to the size I need, and refrigerate it briefly. When it has firmed up only slightly, I scrape both sides of the butter in parchment along the edge of my counter to make it more pliable. This helps prevent the butter from shattering in the dough by increasing its pliability and warming it back up. Research dough lamination, and you'll see that every baker has a different way of doing it, especially this part! The most important step of this section is to make sure your butter and your détrempe have the same consistency, which means you'll need to check whether the butter and the détrempe are both similar in temperature and pliability. A similar consistency will ensure these elements maintain their integrity during the folding process. So, this is the method I prefer for encasing the butter into the dough. I start with the beurrage, rolling the butter out to 7 x 9 inches, for example. Next, on a floured surface, I roll the chilled détrempe out into a long rectangle, say 7 x 18 inches. You'll note that the butter and the dough have the same width and that the length of the dough is double that of the butter. I then place the butter block into the middle of the dough with both the long end of the butter and the long end of the dough facing me. Because of the measurements, you'll be able to take both sides of the détrempe and fold them over the butter exactly so that they meet in the centre of the butter block, like a book (this is where all the books come in). The dough with butter in it is now referred to as the paton. Once you've encased your butter in the dough, with a rolling pin, gently pat down the seam of the book. 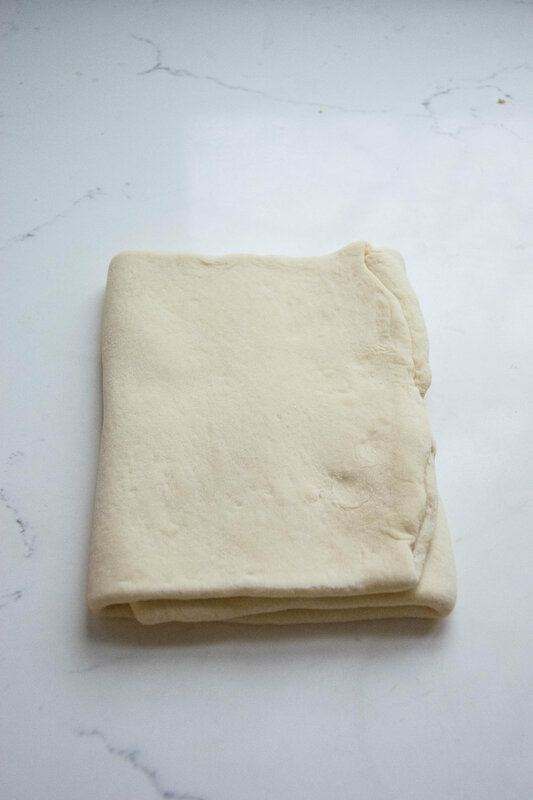 Then tap the dough gently along its surface to gradually begin rolling out the dough for your first book fold. Using your hands is important: make sure that the paton is still relatively cold and that the butter is not too soft or too cold and breaking up in the dough. If too warm, refrigerate the dough on a baking tray for 10 minutes. If breaking up in the dough, leave to sit on the counter for 10 minutes. Begin rolling the dough out in one direction. Avoid pressing down too hard on your rolling pin as this could break up the butter. This will be a slow process: butter is temperamental. Your goal is to roll out the dough into a 7 x 18 inch rectangle. Do this slowly, and if you feel the butter begin to soften, leak out, transfer the dough to a baking tray and refrigerate for 10 minutes. Again, if the butter is breaking into pieces, leave on the counter for 10 minutes to warm up. Continue rolling the paton out to the indicated size. Once you've got the proper dimensions and the short end of the dough is facing you, fold up the bottom third of the dough. Once that's done, fold down the top third of the dough (onto the bottom third that's just been folded up). You've just done your first book fold! Now the important part in achieving even layers. To do so, rotate the dough by 90 degrees in the same direction after each fold. The easier way to think of this (since it's quite easy to lose track of which direction you started and ended) is to always keep the book opening on one side. I keep mine on the right. Now that you've completed your first fold, wrap the paton in plastic wrap and refrigerate for 30 minutes. A note here on the refrigeration intervals: the purpose is to ensure the butter remains cold enough that it rolls out nice and evenly in the dough. Spoiler alert: not all refrigerators are the same. The fridge in my old apartment took about 30 minutes to chill the dough appropriately. In my new place, it only takes about 15 minutes. Talk about efficiency! You'll need to test out your own fridge. The problem you can run into is that your butter gets too cold before the next fold. Whenever my paton is ready to be rolled out again, I take it out of the fridge and let it rest on the counter for 2-3 minutes per side. This allows the butter warm because it could shatter if too cold at any step along the way. If it's summer and hot in your apartment, you'll have to adjust accordingly! After 15-30 minutes, remove the paton from the fridge. Place it back onto a floured work space with the book opening on your right. Leave to rest for 2-3 minutes, and then flip over and let rest for another 2-3 minutes. Roll the dough out to the same dimensions as before, and with the opening on your right (which will now sort of be squashed down and more difficult to see), fold the bottom third of the dough up and the top third of the dough down. Rotate 90 degrees (which means a newly-formed book opening will be on your right!). And so on and so forth until you have completed the number of folds that the recipe calls for. This could be as few as two and as many as six! I vaguely remember saying this before: refrigerate the dough between folds so that the butter maintains a steady temperature! You can see that I was impatient and that my butter broke up in the dough during fold 3 (I'm still getting used to the extreme efficiency of my fridge). One last thing. About edges. And them being even. This is a struggle for me. My pastry edges always look rather wonky. It's possible to square off the edges by pulling gently on the dough where you need to. When doing my folds, if the edges are not so square, I sometimes cut off some of the dough to even them out. The problem with wonky edges is that you could end up with bits of dough with no butter in them. This will cause some of your pastry to be dense rather than flaky. So when you need to, it's okay to even off those edges with a knife. 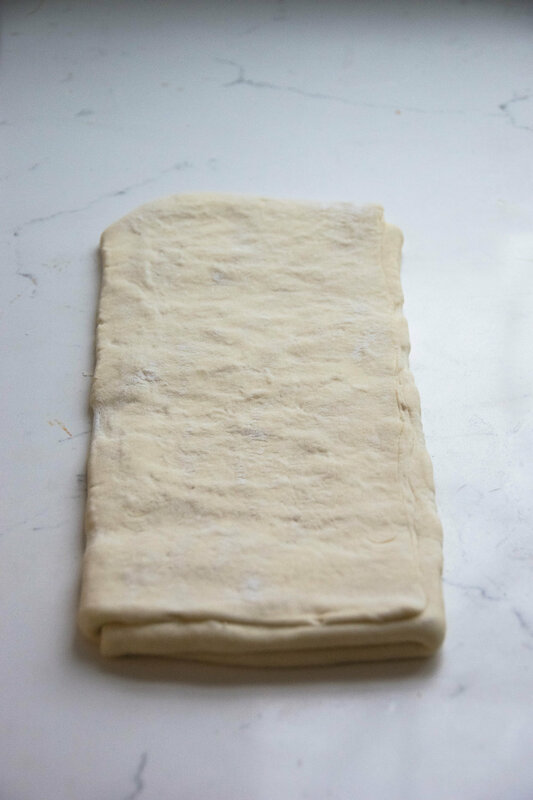 After the lamination is done, you'll do different things with the dough before baking it. 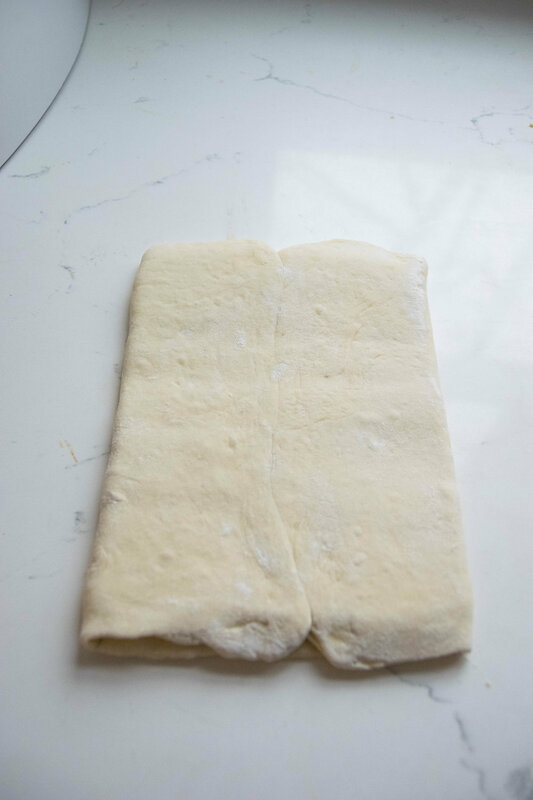 This could range from rolling it out nice and thin for puff pastry or rolling it out to specific dimensions and cutting it into triangles, for croissants.